For the ultimate romantic, this Victorian-inspired set is one of a kind. 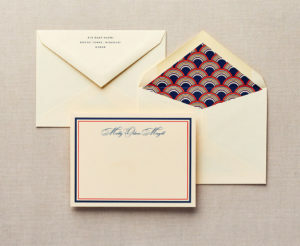 Gold foil stamping and a decorative border decorate the invitation while a large rose graces the envelope lining. For 100 sets, pricing starts at $18.50 per set for Flat Printing, $21 per set for Flat Premium and $24 per set for Letterpress Printing.